Severe thunderstorms bringing vivid lightning, rain and wind rolled through North Texas Wednesday morning. The National Weather Service issued tornado and severe storm warnings for several North Texas counties early Thursday morning as a large summer storm pushed through the Metroplex. 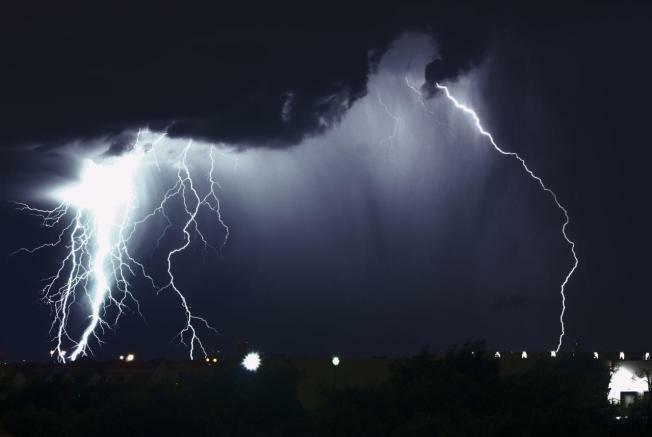 Wind gusts from the storm were reported near 70 mph while vivid lightning and heavy rain poured down nearly three inches per hour on North Texas. Tornado warnings were issued in Parker, Tarrant, Dallas, Ellis, Navarro and Hill counties -- though they have all expired with no report of a confirmed tornado. The largest impact from Thursday's early morning storms were localized flooding and wind damage. At about 8:30 a.m., officials with DFW International Airport said airlines are reporting about 30-45 minute delays. Now that the storm has passed, officials expect the delays to diminish quickly. "There have been 10 cancellations this morning, but the first departures and arrivals have come and gone already today," said Brian Murnahan, of DFW International Airport. "The remainder of Thursday will be mostly cloudy with temperatures staying in the mid to upper 80's. A stationary front to our south will trigger more showers and storms later in the day," NBC 5 meteorologist Samantha Davies said. "The threat for severe weather is low, but some storms may be capable of producing gusty winds and heavy rain. Showers and storms will be possible again on Friday." Davies added that weekend temperatures will warm back into the 90's with sunshine returning to North Texas.